Award winning Smoking Apples produce high quality theatre, that more often than not, works with difficult, hard-to-digest subject matter. 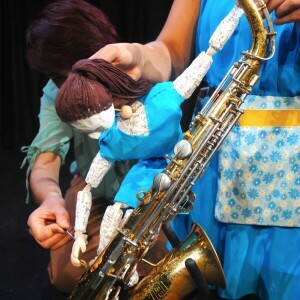 Using puppetry and visual theatre, the company create innovative shows, making their subjects enjoyable and accessible for audiences. They combine puppets, live actors and an identifiable and unique style of movement. Molly trained alongside the other Apples at Rose Bruford on the European Theatre Arts Course. She wholeheartedly blames her time studying abroad with them, in Prague (now her favourite place in the whole world), for introducing her to the three loves of her life, Puppetry, Czech Beer and travelling. 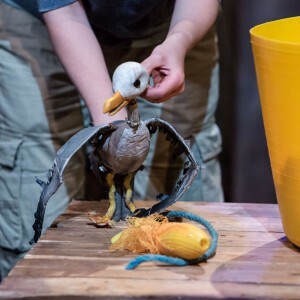 With a keen interest in movement, Molly is fascinated with the anatomy of the body, both in performer and puppet, and this combined with a cracking story is the type of theatre she both likes to see and make. 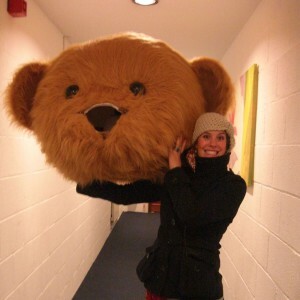 She also freelances as a puppet director/consultant, higher education facilitator and as a creative project manager. 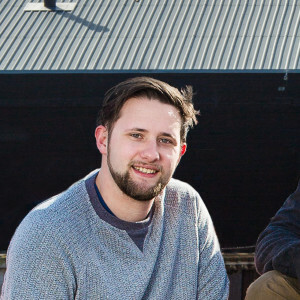 Like all of the apples, Matt also trained at Rose Bruford and co-founded Smoking Apples in 2010. Matt comes from a background in comedy, performing arts and dance (yep that’s right dancing) at Homewood school. He enjoys working with puppets and particularly the relationship between the puppet and audience, engaging the audience’s focus into wholeheartedly believing in essentially… an inanimate object, (regardless of whether the puppet is 4 inches tall or 16 foot). Alongside Smoking Apples, Matt works as a freelance Puppet Maker, set builder and general DIY making. Hattie is a musician and performer who studied puppetry and alternative theatre in Prague as part of her degree at Rose Bruford College. 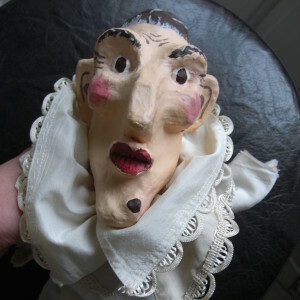 Having loved puppetry and art from a young age Hattie enjoys both making and operating puppets with Smoking Apples, she enjoys the challenge of bringing inanimate objects to life in a way that is engaging and relatable for audiences. 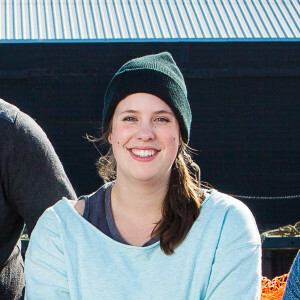 Alongside devising and directing theatre, Hattie works as Marketing Officer for mindset skills training company InnerDrive, and teachers drama and puppetry to various ages and abilities. We (Molly, Matt and Hattie) started our love affair with puppetry (and each other) when we studied together in Prague at DAMU on the Puppetry and Alternative Theatre course. 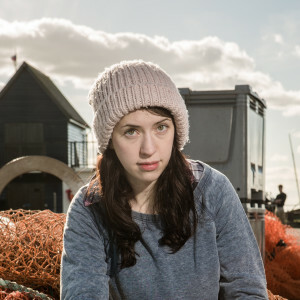 We met Aimee (the year above us at Bruford) at an audition to puppeteer for Kinetika and got on so well in and out of the rehearsal room that we created Smoking Apples Theatre Company. In 2009, we were still studying for our degrees in European Theatre Arts at Rose Bruford College but enjoyed a break from studying whilst working with Kinetika throughout the summer and at the occasional weekend event. We created our first original production Whispers from a Wandering Tent for Rose Bruford Symposium week, which we toured throughout the Summer at outdoor events and venues. Shortly after this, we began to work together on a 20 minute performance called Seemingly Invisible for Molly’s final year degree show. 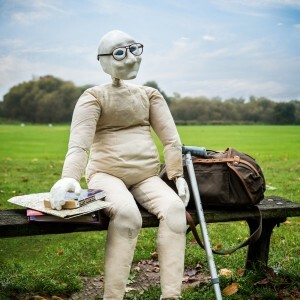 The piece, which features our puppet ‘Harry’ as a magical force bringing unlikely characters together, went to the Edinburgh Fringe Festival the same August. It had such positive responses we decided to develop it into a full length piece of fringe performance after graduating. 2011 saw us head back to the Motherland (Prague), performing Seemingly Invisible at the Prague Fringe Festival, IYAF and the Blue Elephant Theatre. We did our final performance of this show, with Aimee Holmes, in Wiltshire before deciding to part ways creatively. Don’t worry though, she’s still one of our bestest pals and will always be an apple at heart. We began working with the International Youth Arts Festival (IYAF) as puppetry directors for From Amazon, which was performed for HRH The Earl of Wessex, Prince Edward. We were then invited to join the Creative Youth Creative Talent program, which gives young companies an opportunity to perform and develop their work. Late in 2011, Community Brain invited us and fellow Creative Talent company Dumbshow to create a Heritage Lottery funded, site-specific show, Seething Wells and The Death of King Cholera. We also started to work behind the camera, puppeteering in TV Adverts for Weetabix and Webuyanycar.com. Most excitingly in November 2011 we worked on and puppeteered on Eider Falls at Lake Tahoe – a beautiful music video for Kate Bush using shadow puppetry. During 2012 we took part in Animate Festival, an outdoor festival, in association with IYAF and also puppeteered for the Queen on Blackfriars Bridge at the Jubilee parade. It rained and we got soaked but hey ho, Rule Britannia and all that! We started working on The Wordcatcher scratching the show at The Lyric Hammersmith and Battersea Arts Centre before performing the full show at IYAF and The Blue Elephant. Following the 2012 Olympics, we lead the medal winners across London with giant Lion puppets in Our Greatest Team Parade (which was awesome). Later in the year, we made A Christmas Carol in collaboration with Samuel Wyer and Petersham Road, a promenade and immersive show that sold out for December. It was Christmassy, there was mulled wine, we went to work in a beautiful house every day – happy days. Towards the end of 2012, we met with Little Cauliflower and submitted our very first Arts Council application to start a research and development project… CELL. From incurable diseases and new collaborations, to mythical creatures and fairy tales, 2013 was a year of real change for us. We received our first round of funding from Arts Council England for CELL, a new collaboration with Little Cauliflower exploring the story of one man and his fight with Motor Neurone Disease. In June, we worked with the BFI on a residency for Year 9 Lambeth students, helping them to design, make and operate puppets for a multimedia, collaborative performance of Hansel and Gretel. This was followed by our first project with Global Arts Kingston and the local Tamil School bringing their Traditional Tales to life for a performance at Kingston Connections 2013. 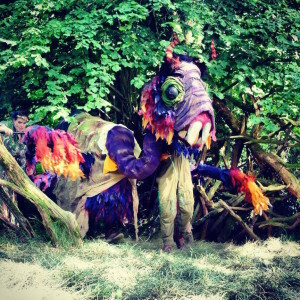 August transported us to Wilderness Festival, to live in the woods all Summer, for a huge promenade production of Jabberwocky, in collaboration with Petersham Road, Secret Productions and designer Sam Wyer. 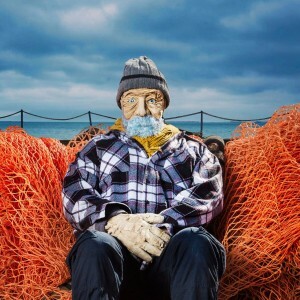 Suspense Festival was the highlight of our Autumn season, we performed The Wordcatcher in this highly acclaimed, biennial, London Puppetry Festival. To finish off the year, we rejoined Petersham Road for Fezziwig’s Christmas Cracker at the Charles Dickens Museum for which we created a 20 minute rolling piece about Scrooge’s murky past, using storytelling and shadow puppetry. 2014 went out with a bang and some very tired but content Apples! Our year started with the premiere of CELL at the Little Angel Theatre where we played to sold out audiences at their FIRSTS Festival. We then took the show to Greenwich Theatre and Incoming Festival and CELL was nominated for a Peter Brook Award 2014. In August we skipped off to some festivals, taking a giant UV grasshopper to the Merry Prankster’s Ball at Wilderness and our 10 foot goddess Xalia to Shambala. Our education and outreach work reached a peak with puppetry workshops at an all time high and we started teaching a puppetry module at Buckinghamshire New University. 2015 shaped up to be an absolute corker! We chucked ourselves in at the deep end, kicking things off with a Spring UK tour of CELL which was co-produced by house. We then took Ted on another adventure in August to the Edinburgh Festival Fringe where he played for the whole month, received a string of five star reviews, award nominations and sold out audiences. Chuffed doesn’t even cover it. 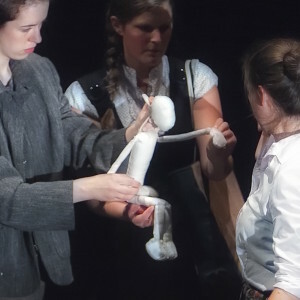 We were also back at Buckinghamshire New University in the Spring, teaching the second year module on puppetry and started running Spectrum Youth Theatre at the Little Angel Theatre in the Autumn. SYT is a puppetry youth theatre specifically for young people with high functioning autism and Aspergers. This has been an extremely busy year for us, the year started with the completion of our first project with the Little Angel Theatre’s Spectrum Youth Theatre, the group performed a puppetry piece inspired by Mary Shelley’s Frankenstein in March. Alongside this, Matt was designing and making the set and puppet for Intrepid Ensemble’s Jellyfish. We were also delighted to be accepted onto the Oxford Playhouse’s Evolve Programme, so we have been making new Oxford friends and will be working with the theatre until April 2017. In the middle of March we started our second tour of CELL funded again by Arts Council England, kicking off at the lovely Prema Arts Centre in Dursley, stopping in Germany at the Recklinghausen Fringe Festival at the end of May and then finishing the tour at Beverley Puppet Festival in July. It was great to get Ted out of the studio and on the road again. No time to miss Ted though, June saw us starting an entirely new, all female show, New Clear Vision, funded by Arts Council England. But don’t panic, Matt hasn’t gone anywhere, he has been devising with us and together with Hattie, creating our beautiful new leading lady puppet Kate. You can see some pictures of her as a prototype and as a nearly finished puppet here. We developed the show in collaboration with 3 venues, South Holland Centre in Spalding, Bike Shed Theatre in Exeter and the Oxford Playhouse. Next on the schedule was the Edinburgh Fringe, (just that little festival up in Scotland in August). Well, we took In Our Hands up there for the whole month and got a string of 4 and 5 star reviews, and Matt was even interviewed for a feature in the Scottish Times. We got back to London in September to finish the R&D of New Clear Vision in Oxford, then after a whole week off we went back to rehearsing for an Autumn Tour of In Our Hands. From the end of September to November we took the show to 18 venues across England, we did 5 post show talks, 3 workshops and 20 shows in total. To round off the year we took our two big outdoor puppets, Xalia and Atom, to help with the Christmas Lights switch on in Oxford, it was a really great end to a busy year, working with some of our lovely associate artists and a handful of volunteers we definitely hope to see again.